Could the AATA actually withdraw support from the Washtenaw and Livingston Line? A year ago, the Ann Arbor Transportation Authority board had a serious discussion about whether to continue support for WALLY, the proposed train between Ann Arbor and Howell. As the Ann Arbor Chronicle reported, the discussion at the special board meeting of August 10, 2010 was vigorous. (See the minutes of the meeting relating to WALLY.) Now the subject has come up again. How long can the AATA continue to pursue this project without a clear path to success? The current MDOT list of rail projects appears to use the R.L. Banks estimates (numbers are $millions). The figures do not necessarily represent expenditures, just a budget. Even if Federal funding does come through, it will only at the very best pay for 80% of costs. The “Other” column calls for $11.5 million to be contributed by undesignated parties, almost certainly including local governments. As a point of comparison, AATA’s 2011 budget shows revenue from all sources as $27 million, but after expenses, an operating surplus of only $88,000. At the time of the August 2010 meeting, WALLY had failed to obtain a grant under the TIGER program. This was one of the programs under ARRA (American Recovery and Reinvestment Act, part of the stimulus program in President Obama’s first half-term). But staff had applied for funding under a second round, named TIGER II. Board member Sue McCormick suggested that perhaps funding under TIGER II, plus additional state commitment, should be viewed as milestones and continued AATA support should be contingent on their achievement, a view that seemed to be supported by Bernstein. Board member David Nacht put a lid on all this rebellion, saying that the board did not need to take any action at this time, since the $50,000 was already in the budget. The board followed that lead. But as AnnArbor.com reported, WALLY failed to obtain funding under the TIGER II program. Though there was discussion of applying for CMAQ (air quality) grants, no record of this appears in the committee meeting updates of the last year. Nacht suggested that rather than use these grants for station design, AATA should simply return the money to the grantors, or ask them if the money could be used for another purpose. He said that the AATA board are fiduciaries of the public interest and that it is critical that public agencies get the shift in the national mood – “it’s someone’s money”. He further stated that he couldn’t believe that WALLY was going to “occur” and that it was a “no-go” without Livingston County’s active (monetary) participation. Michael Benham, staff in charge of the project, acknowledged that there was no identified source of operating money on either side of the county line. But the AATA’s executive director Michael Ford cautiously defended the project by pointing out that a good deal of money and effort had already been spent and Benham explained that the station designs were the next step in completing an environmental assessment necessary for next steps in seeking funding. According to Benham, the Michigan Department of Transportation (MDOT) says that WALLY is #1 on the list for a TCSP (Transportation, Community, and System Preservation) grant. (That evidently meant that MDOT gave this project top priority among the state’s requests, as the grant information states that they will take state prioritization into account. The grant application deadline was June 3, 2011; the grant amounts are 80% of the cost of a project. Thus, it is likely that some time will pass before the result of this grant request is known.) But the TCSP program—if it has survived the recent Federal budget cuts—is for planning and implementation of transportation systems, not for operation and capital expense. The amount available for the entire country is $61 million. Based on the discussion at the August 2010 budget session, it appears that there would be support from at least some other board members for a serious consideration of removing WALLY from the upcoming budget, if this item makes it to the Board agenda. Indeed, Great Lakes Central Railroad does promise a passenger train service between Ann Arbor and Traverse City on its website. And it is clear that Traverse City community and business leaders have great hopes for a rail connection. They recently hosted a recent workshop where County Commissioner Conan Smith (and current BOC chair) reported on progress with the commuter rail project. Former BOC chair Jeff Irwin is now a state representative, and has been a strong advocate. With Ann Arbor’s mayor nearly fixated on the project and with this strong political backing, does the AATA board have the starch to make such a decision purely on financial grounds? Discussion among the board members and staff present after Nacht dropped his bomb centered on the money already spent, including the MDOT money used for track upgrades and refurbishing cars. But those can both translate to other transportation projects. Note that two of the cost items on the MDOT project funding list are refurbishing and leasing railway cars. Those belong to Great Lakes Central Railroad (Mayor Hieftje’s friend Lou Ferris, remember?). MDOT has already spent money to do one train’s worth. (A “train” is one coach, a cab car for the engineer, and the locomotive.) That includes adjustments so that the cars conform with the Americans With Disabilities Act. SEMCOG, which is the agency coordinating the East-West (Ann Arbor – Detroit) commuter rail project, has additional pictures on their website. It is intended that some of the Great Lakes Central cars will be used on the East-West commuter rail. But Great Lakes Central will retain ownership. The State of Michigan owns the tracks for the WALLY route. Some of them have also been upgraded to accept a faster rate of travel, essential for a commuter trip. MDOT has funded those repairs. This would be helpful for freight traffic on these state-owned tracks. There are so many problems. It will be impossible for WALLY to operate without generous funding, preferably from the Federal government. But it does not qualify for a variety of rail programs because of defects in demonstrated ridership and other factors. Opportunities like the TIGER grants (part of the expired stimulus program) are not likely to come along again in the current political climate in Washington. Though the UM’s offer to buy tickets for its employees is often cited, the farebox revenue is not enough, as demonstrated by the R.L. Banks study. An operating subsidy is needed. Almost as an aside, the plans call for Ann Arbor to construct a station at Barton Drive. (WALLY does not go to Fuller Road Station.) But where is the money for that? The Ann Arbor Railroad owns the tracks beyond Barton, and has refused to deal. This prevents WALLY from having a station downtown and (somewhat amusingly) at Michigan Stadium, as wished. WALLY has already been incorporated into the Transit Master Plan (see their website). But it is not clear how the financing from that will support WALLY and all the other county transportation needs. Staff actually indicated in their 2010 report that the inclusion of WALLY might detract from county-wide support for the plan. WALLY does not stop in Brighton, the most likely destination for Ann Arbor travelers. Given all that, one can only hope that AATA Board members can see past a lovely dream of trains and look at the financial and other prospects to make a real-world, responsible adult decision to put this project off their table so that they can get on with the other very real, very important transit needs for Ann Arbor and the region. Perhaps a little training in Bayesian thinking would help. Note: to read a differing view, see the report and discussion on Wake Up, Washtenaw. Its author, Larry Krieg, has been an enthusiastic proponent of commuter rail. Interestingly, his principal argument for keeping WALLY alive is to support Transit-Oriented Development. Hamburg Township in Livingston County is already altering their Master Plan to anticipate development spurred by WALLY. UPDATE: In an article published in the Ann Arbor Observer (arborweb link, May 2011) Hieftje is cited as saying that the lack of a rail connection to downtown means that “prospects aren’t good” for the north-south commuter train. 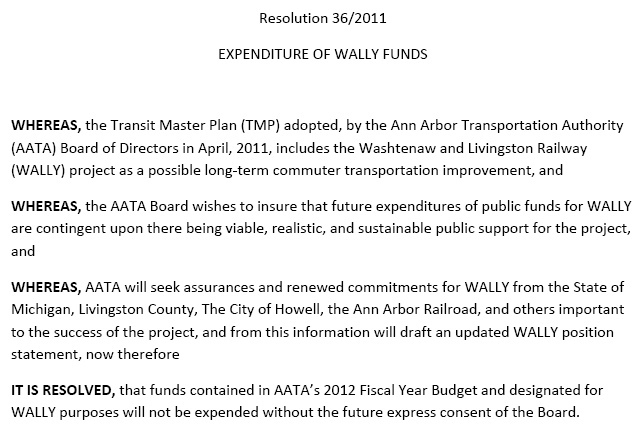 SECOND UPDATE: The budget adopted by the AATA Board on September 16 includes funding for WALLY. This is after the staff coordinator for the project, Michael Benham, presented a report that updates some of the estimates cited above. This WALLY Status Report also presents some optimistic scenarios for funding (the Federal New Starts program, for example, has very strenuous ridership requirements) but is also forthright in outlining some of the obstacles. Funding for Operations: MDOT has taken the position that funding for operations beyond a possible CTF contribution are the responsibility of local communities. Although federal CMAQ money might be applicable to fund a demonstration, longer term funding mechanisms do not currently exist. In Washtenaw County, funding for implementing the Countywide Transit Master Plan might include eventual funding to pay for a share of Wally operations. Some share of expenses would presumably be borne by Livingston County, but no known initiatives are currently underway to develop a funding source for Wally. Accordingly, the board passed a resolution specifically placing some safeguards around further expenditure of funds for WALLY. THIRD UPDATE: Governor Rick Snyder addressed the state regarding his transportation and infrastructure proposals (October 26, 2011). In his full statement he says that “Provided additional federal funds continue to be available, Michigan will work to develop and support accelerated passenger rail service from Pontiac and Detroit to Chicago, and to initiate Ann Arbor to Detroit and Ann Arbor to Howell commuter rail service.” (Italics mine.) With this statement, he lends a limited support to WALLY. FOURTH UPDATE: In a recent announcement by the US Department of Transportation, TIGER III grant awards were listed – and WALLY was not among them. This was perhaps the last best hope for Federal Funding for this project. It is time for the AATA to remove it from the TMP so that no further local funds are spent on it. The only TIGER III grant for Michigan is to repair a bridge near Portage that leads to a green energy landfill (a bioreactor). 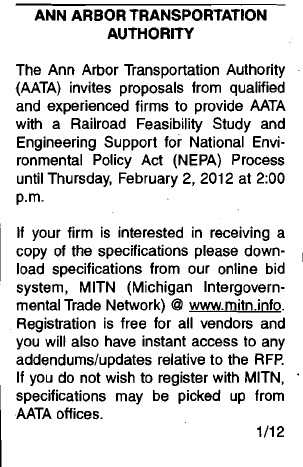 FIFTH UPDATE: There was consternation in some quarters at the appearance of a notice in the Washtenaw Legal News (January 12, 2012) of an RFP for a “Railroad Feasibility Study and Engineering Support for National Environmental Policy Act (NEPA) Process” posted by AATA. The description fit the activity for which a grant was awarded to the Fuller Road Station. But on examination, the specifications for the RFP clearly stated that a consultant was being sought in connection with WALLY. The specifications provide interesting reading about the status of WALLY, especially with regard to progress on negotiations with the Ann Arbor Railroad (AARR). Evidently there is little progress on that front. As it stands, the only station being actively planned is at Barton Road. WALLY is still part of the Transit Master Plan, and, as this RFP demonstrates, an effort to institute it continues, despite the lack of any Federal funding and any likelihood of it in the near future. At the Planning and Development meeting in January, board member David Nacht once again asked whether it was reasonable to continue the project. The answer was that staff would develop some “indicators”. The design studies are being funded by money previously granted by Washtenaw County, Ann Arbor’s DDA, and the city of Howell’s DDA. one that includes addressing liability and community impact concerns – and his answer was yes. The board packet contains an authorization for continuance of the station design process. It is not clear as of this reading whether a local match (local matching funds) will be required. EIGHTH UPDATE: The WALLY Facebook page has an announcement that MDOT will be testing refurbished cars intended for WALLY and East-West commuter (Ann Arbor-Detroit) trains on November 11-13, 2012. NINTH UPDATE: Folks in Livingston County were treated to an optimistic assessment of WALLY’s progress on the basis of the station design grant and the cars tests. TENTH UPDATE: December 29, 2012: AnnArbor.com reports that the Ann Arbor Railroad is being purchased by Watco Companies LLC to expand their freight capabilities in the Midwest. One stumbling block for WALLY supporters has been the refusal of Ann Arbor Railroad to consider passenger use of its railway that runs through the center of Ann Arbor. 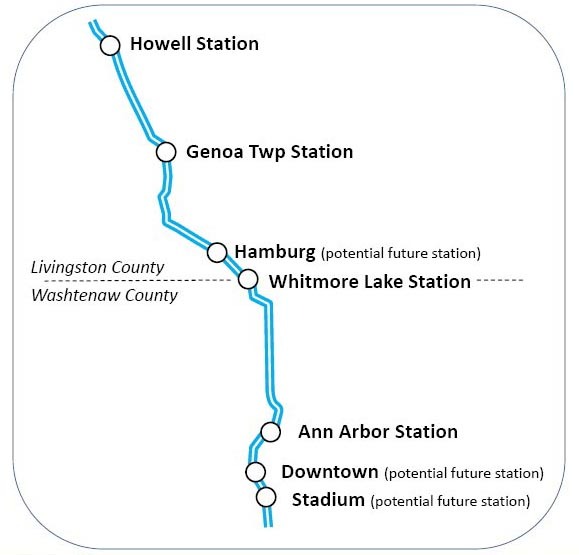 The vision has been to have a station in central Ann Arbor and eventual connections from Toledo to Howell. We don’t know whether Watco will be more amenable than the owners of the Ann Arbor Railroad. ELEVENTH UPDATE: A follow-up from AnnArbor.com on the new owners of the Ann Arbor Railroad. TWELFTH UPDATE: See here a map of WALLY showing stations. The only Ann Arbor location shown is evidently at Barton. THIRTEENTH UPDATE: The contract between MDOT and Great Lakes Railroad for lease and refurbishment of the cars to be used for WALLY and the Ann Arbor-Detroit commuter rail projects was recently renewed and extended. Here are the minutes from a July 9, 2013 meeting of the Michigan State Administrative Board. Amendatory Contract (2009-0489/A3) between MDOT and Great Lakes Central Railroad, Inc., will provide for the performance of additional services and will increase the contract amount by $350,000. State funding will be increased by $350,000, including $262,416 to provide for additional work on the refurbishment project and $87,584 for an additional three months of lease payments. 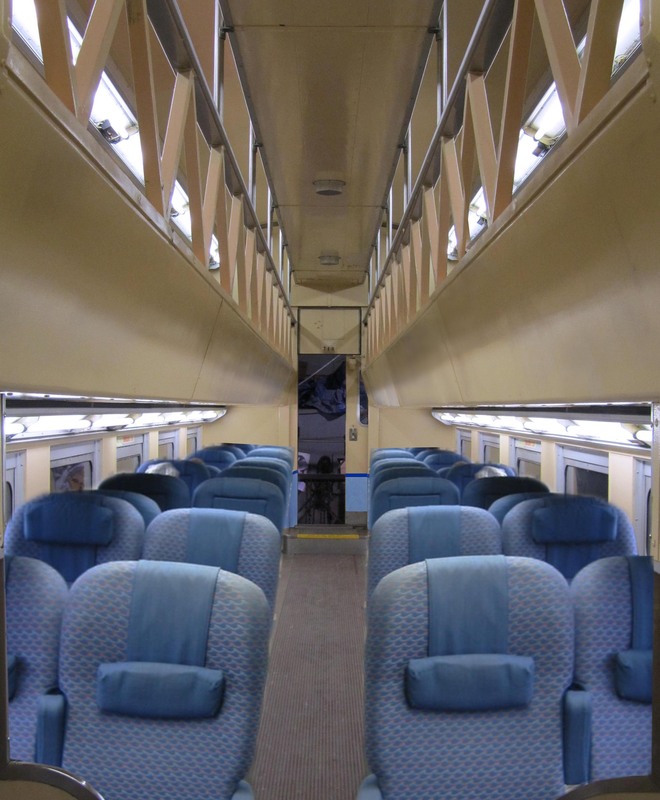 New work items will include installation of restrooms and some additional features on two coaches. The original contract provides for the refurbishment and leasing of 8 cab cars and 16 coaches for the Ann Arbor-Detroit Regional Rail Project and the Washtenaw-Livingston Line Project. MDOT will continue to lease the cars for up to 60 months. The contract term remains unchanged, April 6, 2010, through December 31, 2015. The revised contract amount will be $9,511,632. Source of Funds: Federal Highway Administration Funds – $2,756,342; FY 2009 State Restricted Comprehensive Transportation Funds – $5,413,083; FY 2012 State Restricted Comprehensive Transportation Funds – $178,661; and FY 2013 State Restricted Comprehensive Transportation Funds – $1,163,546. FOURTEENTH UPDATE: Design for a downtown WALLY station has been ongoing through 2013 and a recent story in Ann Arbor News suggests that 415 W. Washington will be the chosen location. FIFTEENTH UPDATE: The Ann Arbor News reports that the Federal Highway Administration is awarding a grant to the AAATA for a feasibility study of WALLY. The amount of the grant is surprisingly high: $650,000. That’s a lot of studying. The story says, “Benham stressed that WALLY commuter rail isn’t an urgent priority for the AAATA, but more of a longer-term project.” The amount of the grant suggests otherwise. SIXTEENTH UPDATE: The feasibility study has now been announced and is presumably underway, ten months after the earlier mention of it. Apparently there were many details to iron out regarding the scope of work for the grant, administered by MDOT. SEVENTEENTH UPDATE: A little note from the Livingston Daily. (February 2015) More questions than answers. Meanwhile, the Free Press details some embarrassing facts about the finances for the cars. EIGHTEENTH UPDATE: As part of the WALLY feasibility study, a listening post has been established. Study leaders are asking for thoughts and opinions. NINETEENTH UPDATE: Questions are being asked in the Michigan House Transportation Committee about the $12 million spent to lease the rail cars. The lease expires at the end of 2015. Here is the account from MLive. TWENTIETH UPDATE: Incredibly, there is now talk of reviving the notion of a train all the way from Traverse City to Ann Arbor and on to Detroit. This is the old vision that John Hieftje first enunciated prior to the establishment of a WALLY initiative. The Ann Arbor News (February 11, 2015) quotes our current Mayor Christopher Taylor as expressing enthusiasm as well. Yet Railway Age, the industry newspaper, says that passenger rail funding is bleak. In a January 2015 editorial, Railway Age said, “Only a damned fool would beg Congress for passenger rail funding, trapping in amber the status quo.” Meanwhile, PRRIA, the successor to the rail funding bill, PRIIA, is in committee discussion. Railway Age reports that the name of the bill has been changed from “Improvement and Investment” to “Reform and Investment”, denoting less Federal tax support and more privatization for Amtrak. TWENTY-FIRST UPDATE: The ongoing coverage by Paul Egan of the Free Press added another chapter today (February 13, 2015) in which the Michigan Legislature’s auditor slammed the two commuter services (WALLY and the Ann Arbor-Detroit) as well as criticizing the money spent on the cars. Meanwhile, the coverage by Chad Livengood of the Detroit News quotes SEMCOG’s Carmine Palumbo in support of the expenditure (not from his budget!) and also AAATA’s WALLY coordinator, Michael Benham. An interesting tidbit is that Benham says not all communities along the WALLY route are committed to helping support the project. TWENTY-THIRD UPDATE: Today (February 25, 2015) a joint working session of three Michigan Legislature committees will grill MDOT officials about those cars. Meanwhile, a new smoking gun surfaced with a letter from Dawn Gabay, the acting executive director of AATA in 2009. See article by Paul Egan of the Detroit Free Press. TWENTY-FOURTH UPDATE: MDOT’S Director, Kirk Steudle, promises to have an answer to the bleeding of money for those rail cars within 30 days. That is roughly by the end of the week of March 23. TWENTY-FIFTH UPDATE: Some rebranding: WALLY is now being called the North-South Commuter Rail and a new website has been set up under that name. Ann Arbor time and location for a public meeting is 6:30 p.m. March 16, 2015 at the Ann Arbor District Library. The website is a curious mixture of social network and active marketing device – in order to subscribe to updates, one must enter a good deal of personal information, including date of birth. TWENTY-SIXTH UPDATE: The desire to implement WALLY is evidently behind objections to MDOT’s plans for US 23 enhancements. As reported by The Ann Arbor News, MDOT has now achieved a positive vote on its “dynamic shoulder” plan from WATS, the Washtenaw County transportation funding coordinator. Ann Arbor representatives voted against it. In response to a call for comment earlier, both AAATA AAATA 04.30.14 and the Michigan Environmental Council (MEC) MEC 4-30-2014 stressed the importance of a rail along that distance (between Ann Arbor and points north). TWENTY-EIGHTH UPDATE: A stunning array of resources on WALLY are available here on a site called Northfield Neighbors Today. All the links, all the news – amazing. TWENTY-NINTH UPDATE: An article in the Detroit Free Press from August 30, 2015 updates the agreement between MDOT and Great Lakes Central Railroad – only now do the payments of $3,000 per day stop. THIRTY-FIRST UPDATE: This article in the Ann Arbor News (dated March 23, 2017) contains most slides and discussions from a public meeting held to present results of the feasibility study begun in 2012. Both the slides and the reporting are detailed and informative. Most comments are skeptical. THIRTY-SECOND UPDATE: Here is a blog post by a long-time local transit supporter and rail enthusiast which is quite critical of the WALLY project. It includes some analysis and many links to reports. Larry Krieg is currently representing Ypsilanti Township on the AAATA. THIRTY-THIRD UPDATE: As of February, 2018, the results of the feasibility study are still available on AAATA’s site. However, it is no longer listed under “Initiatives” on the “About Us” page. This entry was posted on August 13, 2011 at 8:27 pm and is filed under civic finance, politics, Transportation. You can subscribe via RSS 2.0 feed to this post's comments. You can comment below, or link to this permanent URL from your own site. Thanks for what seems to be a thoroughly researched post. I’m starting to understand why so many are getting so frustrated with Hieftje. Thanks! I wanted to be sure that it was documented enough that others could find the relevant information. There is some good information here, though it would be nice if it were less slanted one direction and more objective. I personally know a lot about the project and some of your assumptions are simply untrue. But hopefully people can see past that. Yes, I do have a point of view. However, I am careful not to make statements that are not backed by real information. If you know of “assumptions (that) are simply untrue”, please elaborate. We’d all appreciate the further discussion. Excellent documentation, Vivienne! I find this helpful, while I continue to disagree with your conclusion. Whenever a business venture is contemplated, a cost/benefit analysis should be done and return on investment (ROI) calculated. The studies done so far have focused on the costs. What we need now is analysis of the benefit side of the equation. What return can we expect on such an investment? To use a tired cliché (sorry!) I see the glass at this point as half-full, while others see it as half-empty. Keep up the good research, Vivienne! Thanks, Larry. I thought that your summary of the meeting was a good and fair one also, though again we differ on the conclusion. 1.A cab-car is a regular (bilevel commuter) car with an operating station at one end, so that with a diesel locomotive at the other end the train can be operated either way without turning around. 2.I believe that Great Lakes Central connects with the Ann Arbor Railroad at the top of the grade at Osmer, the passing track north of the Pontiac Road crossing. To have a station in town would merely extend the operation on the Ann Arbor Railroad a few miles to the south. Since the Ann Arbor RR Freight trains run mostly at night, they would not conflict with a commuter operation. 3. If the commuter train operates in the morning and evening, why can’t it operate back and forth (ping-pong like) all day long? My understanding is that the management of the Ann Arbor Railroad has been resistant to commuter rail use for some years, though as I noted in the recent update, they may be softening with the promise of some inducements from AATA. It sounds as though AATA may be planning to put money on the table. You may be correct that a commuter operation would not interfere with their other business, but they have not divulged their objections at an operational level, at least not in a public forum.